Short Synopsis: Two teens decide to take a plane for a joy ride. Not just any plane, but a plane whose engine could go out at any moment. Corky, the instigator, is 10 hours away from earning his license. 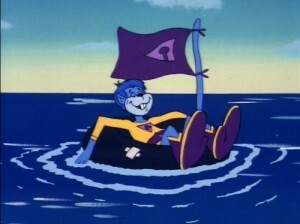 Once in the air Corky decides to “have some fun with the local beach bums.” Two of those bums are the Wonder Twins. Yadda yadda yadda, everything turns out fine. Obviously, super heroes who are to be taken very seriously. It just seems overly complicated. Step 1 – They bump fists and say “Wonder Twins power, activate!” (which we know is just a bad habit and not necessary). Step 2 – Jayna becomes an eagle, Zan becomes purple water. Step 3 – Zan, able to control the shape and movement of the water he’s become, jumps into a bucket, which they must have to lug everywhere they go. I’m not one to mess with perfection, because this is, somehow, perfect. 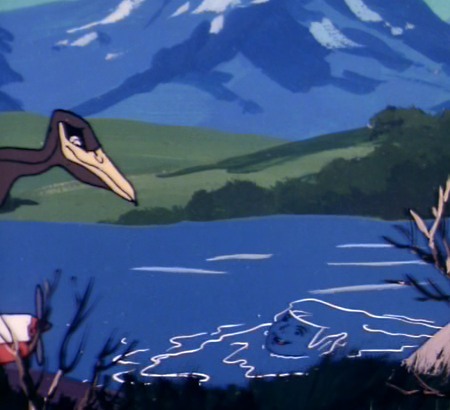 But, can I just say, that the idea that the twins not only have to transform into very narrow areas (animal and freakin’ water), that they have to both do it at the same time is really a special touch. What’s that, Zan? You don’t want to be an ice cube? Well, too bad, Jayna needs to turn into a ring tailed lemur. 1. Jayna can still talk, even if she’s an eagle. And she doesn’t say “I want to eat some salmon,” she says stuff that Jayna would want to say. 2. Zan can also talk as water – the water sloshes out of the bucket when he’s talking. Rude. 3. When he’s a larger body of water, his face shows up to chat (to Jayna, in the form of a pterodactyl). 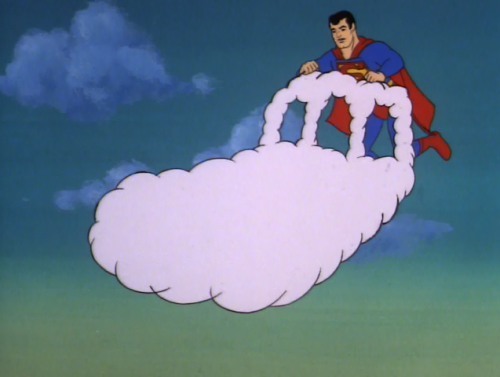 After the Wonder Twins story, Superman shows up and tells us kids he’s going to give us clues to a secret word, a word that will be very important in the next story. Then, he grabs a cloud and starts turning it into a “picture clue.” All we have to do is remember this clue and put it together with the next one. NO! I DON’T WANT ANYMORE CLUES! Tune in next week for the next story, which I assume is going to involve things that children shouldn’t be seeing. P.S. If you want to read even more philosophical musings about The Wonder Twins and Gleek, here’s an entry on the great Point Counter-Point Point Point. in 1977, the Superfriends writers were pot smoking, pr0n lovin perverts. All I got from this was that someone’s name was Corky. Okay, I got more- Gleek is probably the first annoying cartoon weird ‘extra’ character that ruins an already perfect show. Screw him. 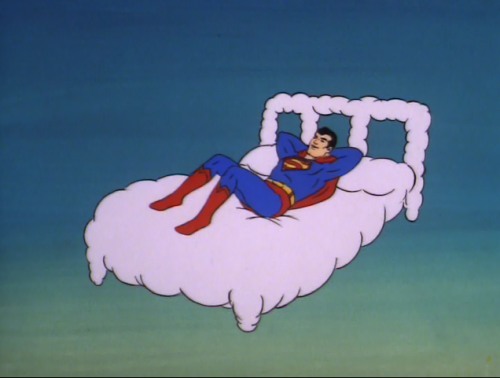 You’ve already mentally blocked out Superman’s indecent proposal, I see. I’m wondering if Gleek is going to end up being the Wendy and Marvin of the show – the only one who actually does anything useful. He’s the one who actually saved the plane from crashing. I have to ask – how many people have clicked the link to buy season 2? None. I figure it’s the polite thing to do since I’m swiping screenshots and making fun of it. This is soooo unrealistic! I mean, seriously, who ever heard of purple water? And Gleek’s tail is way too long, too. Thanks for the link! 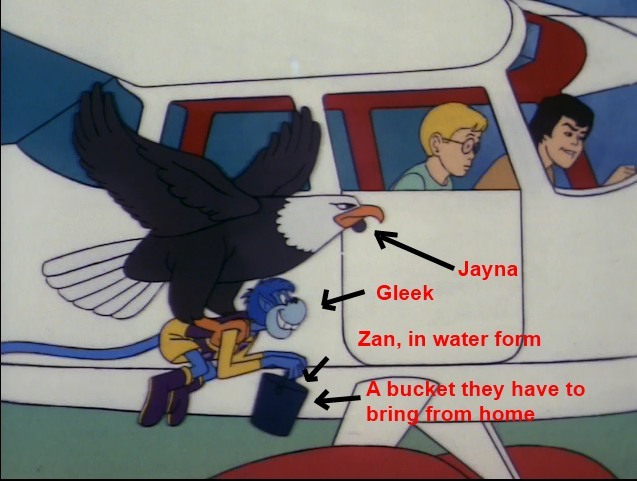 That screen shot with your diagrams showing Zan in the bucket and Jayna carrying Gleek who was carrying the bucket, really shows how the real hero of the group is the bucket. Definitely the most useful out of the four of them. I still don’t understand why any of those ridiculous ‘comic relief’ “superheroes” were necessary. As a kid I HATED them. 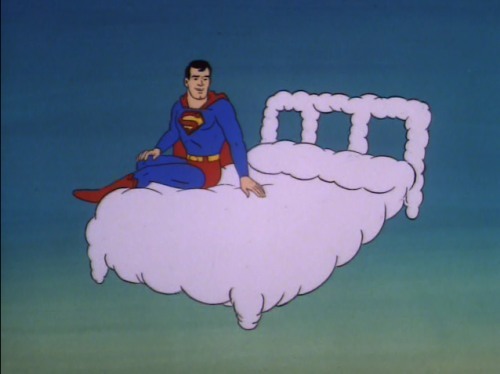 I didn’t even like Jan and Jayce from Spaceghost. For godsake just leave justice to the professionals. Previous Previous post: Here’s a picture of a dog stacked on another dog because I don’t have much going on right now and don’t want to turn my brain on.